Gastric Banding is a restrictive form of weight loss surgery, meaning that it reduces the amount of food that can be consumed in any one sitting. Often called by one of its trade names, Lap-Band® or Realize® Band, gastric banding has become one of the safest and most effective tools in the fight against obesity. Both the Lap-Band and Realize Band systems consist of three core components. The first is the band itself which is fitted around the top portion of the stomach and tightened to form two interconnected chambers. The top, smaller chamber will be the primary receptacle for food and because of the smaller size will make the patient feel full sooner. The band is made of a biocompatible material that has been shown not to cause any allergic reaction in the body. Small chambers, filled with fluid allow for increased or reduced restriction in the band after the procedure. These adjustments will either accelerate or decelerate weight loss. The band is connected to tubing that acts the conduit for the saline solution. The tubing is then connected to the injection port which sits right under the skin and is attached to the abdomen wall during surgery. The injection port allows the surgeon to access the band with a special needle and makes the adjustment process quick and virtually painless. Since the band does not alter any part of the stomach or the small intestine, patients generally have fewer dietary restrictions. Banding may not require long-term nutritional and dietary supplementation because it does not restrict the nutritional absorption of the small intestine. It is a good option for patients who wish to have an adjustable procedure. 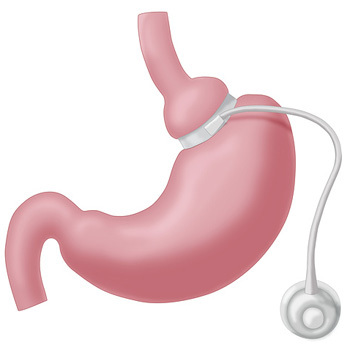 The gastric banding system is fully adjustable and therefore we have the option to accelerate or decelerate weight loss after surgery depending on individual recovery progress. Patients who may be relatively lower on the body mass index may benefit from gastric banding because the weight loss it provides is steady and measured. On average, patients will lose a safe 1-2 pounds per week. It is the safest surgical weight loss procedure we offer, with less recovery time, shorter hospital stays, less pain and fewer restrictions. It is removable in case of need.